Gain insight into how your team's custom fields are being used with reports. This data can be found within the Reports Page, and is accessible to teams on the Unlimited Plan. When you first visit the report, you'll be asked to choose an initial custom field to build the report with. No worries, you can add more or change the initial field once your report is generated. Optionally, set a "Calculation" field at the bottom of each column. Choose the PEOPLE tab to see custom fields by person. Resource managers love this option when using custom fields such as scrum points. See how many points each user has. CRM managers will love tracking which of their team members is responsible for different leads. Choose the TASKS tab to get a condensed list of all tasks matching the custom fields and filters you've applied. Be sure you focus the tables on what matters. 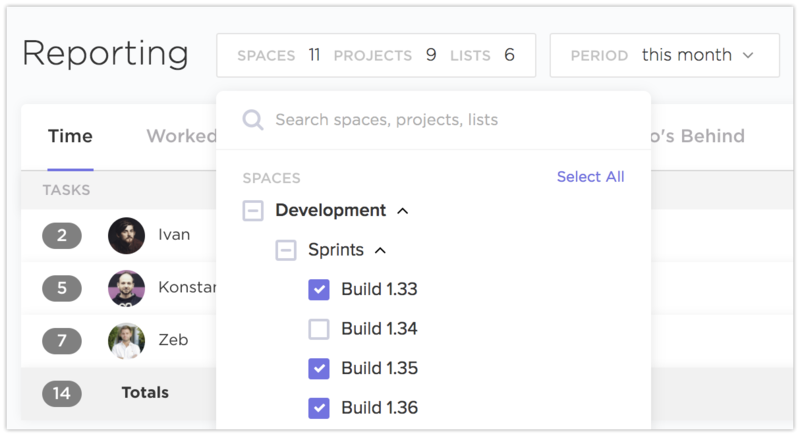 Set the Space(s), Project(s), or List(s) you're most interested in. Besides the new filters mentioned before, custom fields reports also have the power of all filters you're used to in List and Board View. Choose the period for the data you'll be monitoring in the report.